Our latest winding and timekeeping units are now museum pieces! Automatic winding has been applied to tower clocks for over 100 years. Over that time the equipment has culminated in our current model – the AW10 system. Automatic winding can now be partnered with automatic timekeeping, using our PAR 100 unit. By careful setting of the pendulum speed and programmed pausing, it keeps the clock within precise time year-on-year. Power to both winding and timekeeping are powered via a single power supply control unit with battery backup, with low voltage supply to the working units. This enhances safety and guards against any problem caused by power failures. 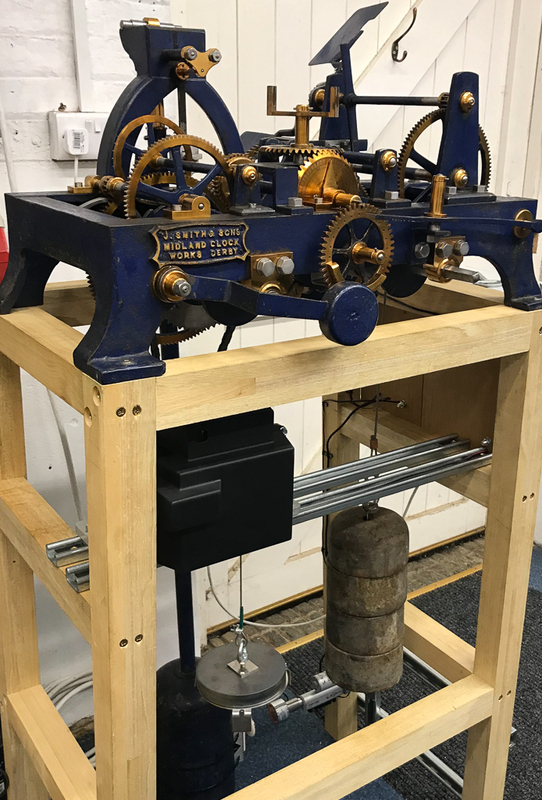 The AW10 autowind unit (with black cover) is mounted on the upper support rails and the PAR100 timekeeping unit is installed below, in line with the pendulum bob. Note the smaller and safer new weight which is sufficient to drive the clock through the autowind system, and compare with the original weight which has been retained on the strike side. Installation of AW10 autowind includes a drive chain to link with the existing winding barrel (see far barrel). The autowind unit has its own (small) weight and cable which is not attached to the clock. The cable visible on the nearer barrel is for the strike side of the clock, which has been retained in manual winding mode for demonstration purposes. Winding and timekeeping units have the benefit of saving the hard work and trouble of attending to clocks located high in towers and often with awkward access. Now these rarely seen aids to clock operation are on view at The Time Workshop in Horsham, Sussex. 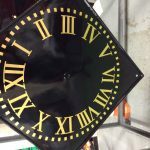 The Time Workshop is a centre of excellence for research, restoration and sale of turret clocks and public timekeeping clocks. 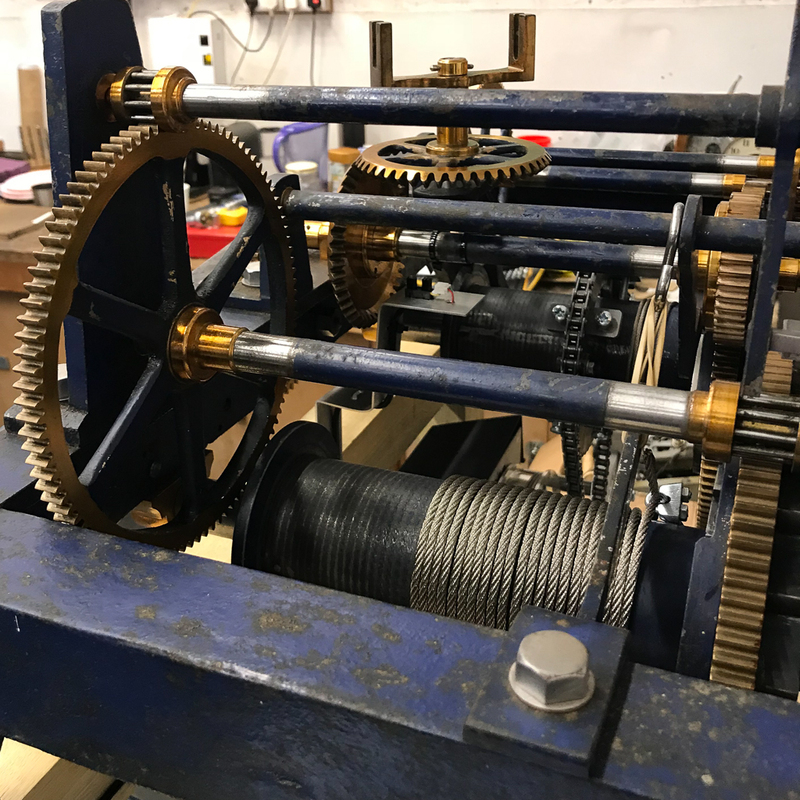 It has a permanent display of turret clocks and master/slave industrial clocks together with a workshop for restoration, and is open to visitors by appointment. 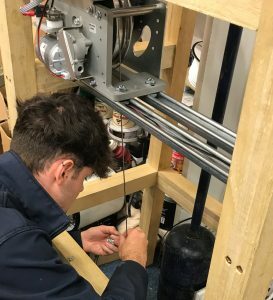 Mitch getting to grips with installation of the new AW10 weight cable on the Smith of Derby movement. 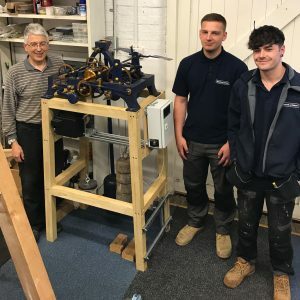 On 30 May, under the watchful eyes of our training manager Tony Charlesworth and director Andy Burdon of the Time Workshop, our two trainees Mitch and Sam fitted winding and timekeeping on a 1937 Smith of Derby 2-train movement with deadbeat escapement. Whilst not entirely replicating a typical church tower installation, the installation provided valuable experience, particularly in the location of the PAR timekeeping unit which had to be secured to the clock display stand. 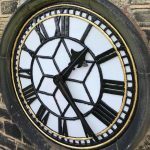 As with all our heritage work, everything was installed with no drilling or alteration to any of the original clock, leaving the way clear for it to be re-converted to its original condition should that ever be required. 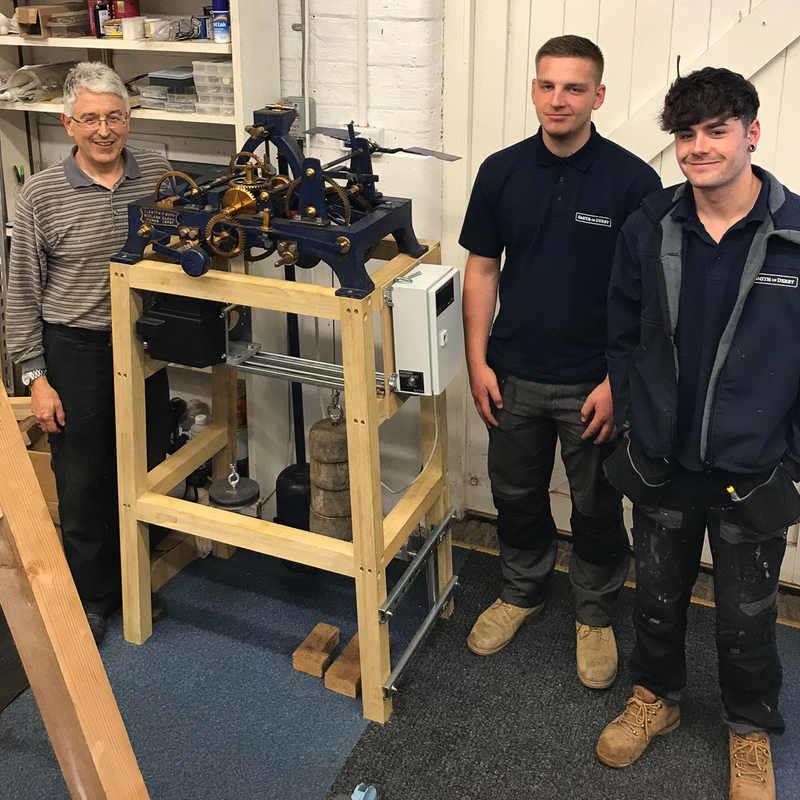 Andy Burdon with Sam and Mitch from Smith of Derby with the completed automatic winding and timekeeping equipped clock at The time workshop, Horsham. The white cabinet fixed to the clock stand is the mains input/low voltage power supply unit.